Adults can grow to well over six feet in length. Their body is bright green with white zigzag striping on the dorsal surface and yellow on the underside. They have a bulky head with heat-sensing pits under the upper lip to help in locating warm-blooded prey; thin neck, stout body and strong prehensile tail. Their tails help keep them in place both while draped over a branch, and also when they strike for prey. Their teeth are quite long, which makes it easier for them to hold onto their meal as they constrict it before swallowing it whole. Young Emerald Tree Boas vary in color from light orange to brick red. They are not yellow like the Green Tree Python however. When juveniles are about seven months old, they begin to change green. This process can take up to a year and is known as ontogenetic coloration. Canopy foliage of lowland tropical rainforests. Amazon Basin region of Colombia, Ecuador, Peru, Brazil, and from Venezuela to Surinam and the Guianas. Small mammals, some smaller bird species, lizards and frogs. The Emerald Tree Boa does have a slow metabolism and may sometimes go months without eating. Up to 25 years in captivity. Are sexually mature at about four years old. Females produce between six and fourteen young after about seven month gestation. Females are ovoviviparous, which means the eggs are retained in the body and laid right at hatching time, which makes it look as though they are live-bearers. 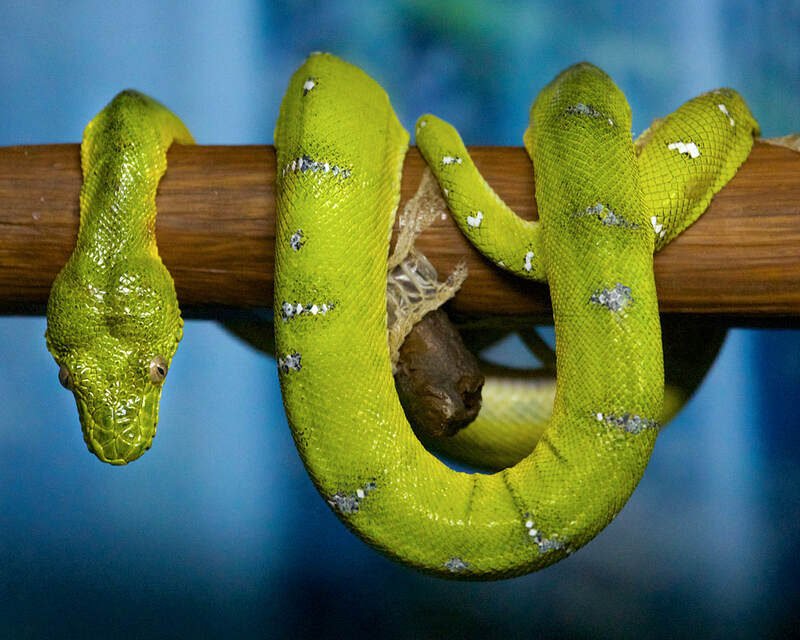 Emerald Tree Boas are solitary in the wild and do not receive parental care. Listed as Stable, but habitat loss is a major concern. 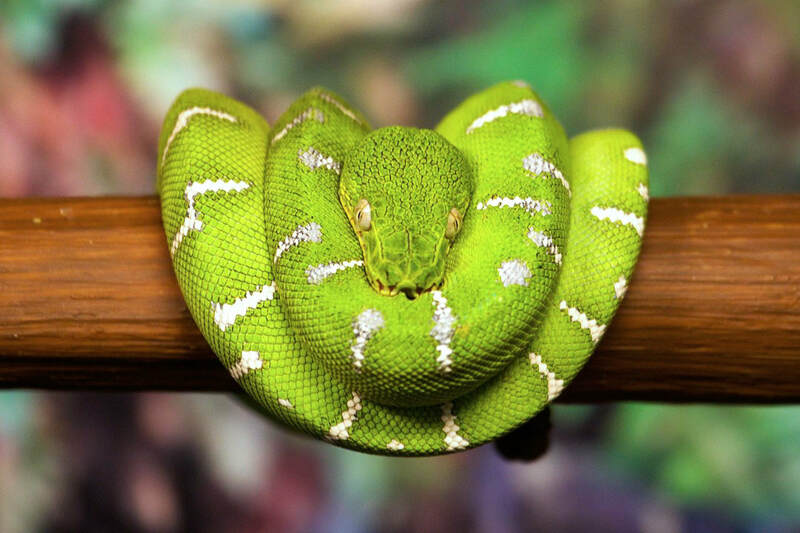 ​Emerald Tree Boas are beautiful, non-venomous snakes that can be found in the rainforests of South America. Their brilliant green coloration and white pattern helps them blend into the tree branches they live on. They are arboreal, which means they are perfectly adapted for life in the trees, and can spend their entire lives above the ground. Come observe our two beauties in the New World Tropics building next time you visit. They may be very still, since they are largely nocturnal. In the wild, they spend a great deal of time during the day coiled over a tree branch with their head right at the center. 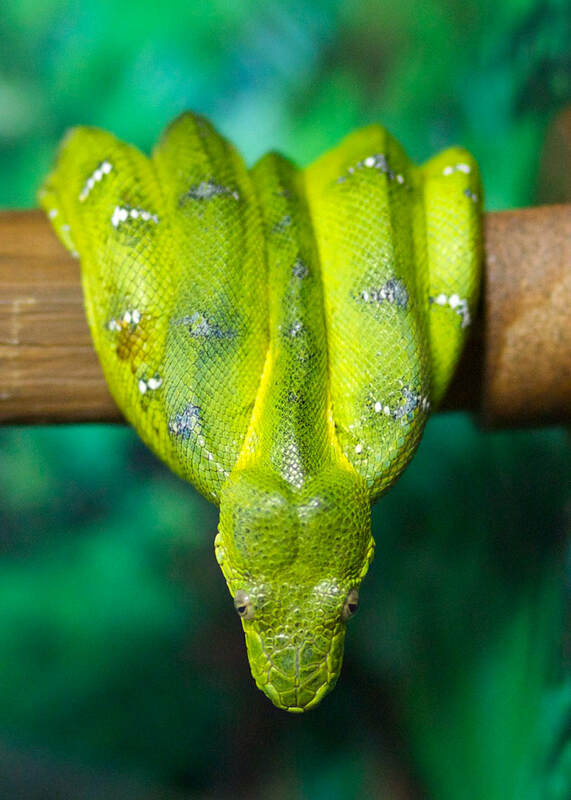 At night, Emerald Tree Boas remain coiled on the branch but will extend their head downward to wait patiently for something to eat.